Every Business, large or small, is required by law to keep its financial records in good order. This involves recording all business transactions into manual records (ledgers) or, more commonly now, into a computerised accounting package, e.g. Sage. From these records a qualified bookkeeper is then able to produce the Final Accounts, comprising the Profit & Loss Account and Balance Sheet. Qualified Bookkeepers are in great demand and a career as a part-time or full-time bookkeeper can be financially rewarding. Our home study courses include a full range of bookkeeping and accountancy training that includes the latest software where relevant. Our expert tuition from fully qualified staff, ensures that you have everything you need to start a career in bookkeeping and accounting. With IDEAL Schools you will have the best chance of passing your exams, and becoming fully qualified. This is an exciting step for anyone planning this major career change. Getting qualified is the first and most important stage. We promise that you’ll not be cast adrift once your studies finish; our door, or phone lines, will always be open to offer help and support. We have tutors who have been through what you are about to embark upon and who are now running successful bookkeeping businesses. They have experience that they are willing to share. In addition we have a Student Group where you can share study and career experiences. You’ll have access to dozens of practicing bookkeepers who will share their expertise. 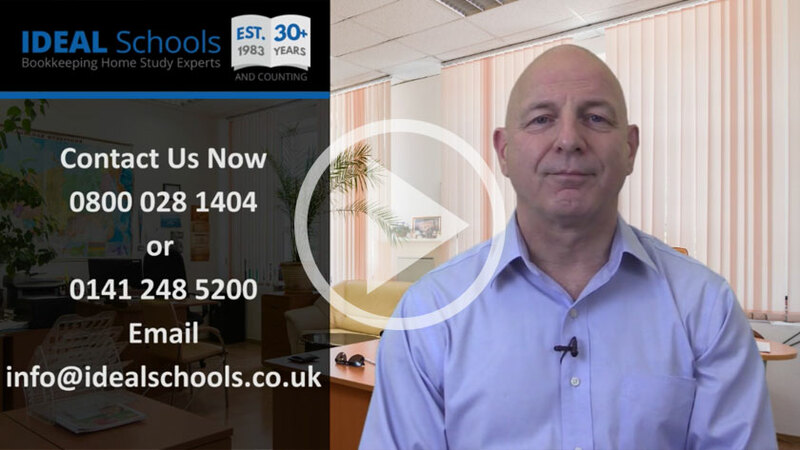 In short, with IDEAL Schools you will be investing in first class bookkeeping & accounting training and you’ll also be provided with the ongoing support that will be vital in your career progression. Whether today, during your study or once qualified, we are here to help. If you have any questions please give us a call on 0800 028 1404 or 0141 248 5200.